RIO DE JANEIRO (CNS) — The cancellation of a scheduled popemobile ride through a working-class neighborhood suggests that, despite official assurances, Pope Francis’ chaotic entrance into the city July 22 may have raised concerns among those responsible for his safety during his first international trip as pope. 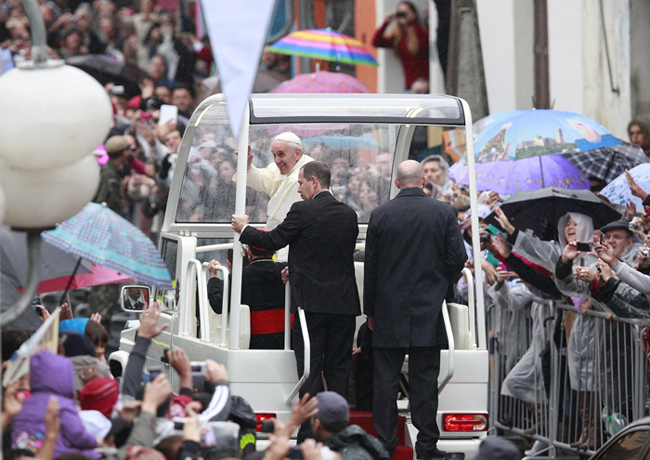 Jesuit Father Federico Lombardi, the Vatican spokesman, told reporters July 23 that the pope would not be taking a ride in his open popemobile planned for July 24 in the northern Rio neighborhood of Tijuca. Instead, the spokesman said, the pope’s ride to his visit to the Hospital of St. Francis of Assisi would be in a closed vehicle. Father Lombardi said the decision did not reflect security concerns, but was merely an effort to avoid the “confusion” of July 22, when Pope Francis used three means of transportation — closed car, open popemobile and helicopter — to travel from Rio’s international airport to a meeting with government officials. The spokesman noted that most of the popemobile rides scheduled for the remainder of the week were still expected to take place. The pope did take one such ride early July 24, on the grounds of the Basilica of the National Shrine of Our Lady of Aparecida. Father Lombardi said Vatican and Brazilian officials met July 23 to discuss logistics for the remainder of the papal visit. He said the meeting did not reflect any heightened safety concerns in the wake of the pope’s ride into Rio July 22, when his Fiat Idea compact van was repeatedly stopped by surging crowds and rush-hour traffic. The main agenda items of the July 23 meeting, according to the spokesman, were choosing the pope’s means of transportation to Aparecida the following day, and the venue of a papal meeting with Argentine pilgrims. It was decided that the pope would travel most of the 150-mile distance from Rio to the Marian shrine by plane, not helicopter as originally planned, because of expected rain and wind. The July 25 meeting with Argentines was scheduled to take place in Rio’s cathedral. Father Lombardi told reporters that the number of security officers assigned to walk alongside the popemobile had not been increased in the aftermath of the arrival events. Asked if officials had replaced the driver who had taken pope’s car out of a specially cleared lane and into ordinary traffic July 22, Father Lombardi did not reply directly, saying only that a Brazilian driver would be preferable to a Vatican employee behind the wheel for the pope’s stay in Rio. The Vatican has sought to downplay any concerns about the pope’s security during his visit here, which ends July 28. Meeting with reporters a few hours after Pope Francis’ arrival in the city, Father Lombardi said the pope had not been alarmed by the crowds that engulfed his car, but had appreciated their enthusiasm. Father Lombardi also dismissed the discovery of a homemade bomb in a public toilet at Aparecida July 21, three days before the pope’s visit there, saying that the device would never have posed any serious danger to the pope or pilgrims. On his ride through downtown in the open popemobile, the pope “was in a vulnerable position and could have been the victim of an attack from a very short distance, but also could have been injured by a reckless member of the faithful trying to touch him,” a reserve officer of Brazil’s military police told the Rio daily O Globo. Pope Francis’ visit followed weeks of sometimes violent anti-government protests in Brazilian cities. On the evening of July 22, some 1,500 demonstrators clashed with police outside Rio’s Guanabara Palace, where the pope was meeting with Brazil’s President Dilma Rousseff and other dignitaries. Father Lombardi said Brazilian officials made the decision to transport the pope by helicopter from downtown to the palace to avoid the demonstrators.